Unbelievable! As my friend John Schroeder says, "Never been more tempted to turn over a few tables." Read here and here. Benny Hinn is to Christianity what Michael Richards is to race relations. with two fabulous pieces on their blogs. Charlie Lehardy writes about Johnny Unitas. Danny Miller writes about Robert Altman. Once, composer John Ylvisaker and I stayed up talking until two in the morning. The subject of Bruce Cockburn came up. Out of the blue, Ylvisaker said, "There's one line of his..."--and I just knew what line he was going to mention and we blurted it out at the same time: "Got to kick at the darkness till it bleeds daylight!" "I would almost kill to be able to write a line like that!" Ylvisaker declared. Any writer or anyone whoever wanted to be a writer would feel the same way. That's sometimes how I feel when I read Charlie's or Danny's stuff on their blogs. They're so good, so insightful, so evocative. You feel every word they write. Treat yourself and read their blogs right now. What follows summarizes a discussion of this passage and its literary context found in The New Interpreter's Bible (except where noted). 1. NIB, I think correctly, sees these verses as part of a section that's comprised of Jeremiah 33:1-26. The theme it ascribes to the section is "Restoration of Jerusalem and Its Leaders." 2. According to NIB, the section can be further subdivided, the first part of which is composed of verses 1-13. It ties in with the preceding chapter, "referring to a 'second' divine word sent to Jeremiah while he was in prison...The chapter anticipates a future announced in the midst of terrifying judgment." ca. 930 B.C. : The Israelite nation divides into two weaker kingdoms, Israel and Judah. Israel [Samaria] is conquered by the Assyrians about 720 B.C, and Judah is destroyed by the Babylonians in 586 B.C. 4. Restoration in the wake of Babylonian destruction of Judah is an ongoing theme of Jeremiah, chapters 3o-33. In 33:1-13, "that notion is made concrete: a vision of the future that holds quite specific ingredients--healing, security, prosperity, and joy--beyond the present death and terror, deprivation, and sorrow." God's forgiveness is also part of the vision, together with an unflinching acknowledgement of the sins of both the nation and its leaders. 5. The next subdivision of this section of Jeremiah, as identified by NIB, is 33:14-26. As I mentioned in my first pass, these oracles are missing from the Septuagint, indicating that they were added by a later editor operating in the Jeremiah tradition. The focus of these thirteen verses is the future leadership of God's people. 6. Consistent with what I noted in the first pass, NIB points out that this section echoes chapters 22 and 23 of Jeremiah. It indicts Judah's political leaders for failing "to render justice and righteousness in the community and announcing God's intention to provide leaders who will do that." 7. But the vision is about more than restoration of things like "abundance, prosperity, and partying. It also includes the reestablishment of systems of governance and [worship], creating leaders who will rightly render the affairs of the people and will lead them in their worship of the Lord." 9. This struck me as very important as I studied the NIB's commentary of the passage: Forgiveness is part of the vision in this passage. But there is also a social dimension throughout chapters 32 and 33. God means for the restoration to have an effect on economic and social practices, because God is interested in all aspects of our lives. 14The days are surely coming, says the Lord, when I will fulfill the promise I made to the house of Israel and the house of Judah. 1. Israel, as mentioned in the first pass, is the Northern Kingdom or Samaria. The Southern Kingdom is Judah or Judea. 2. We may forget our promises. But God never forgets His. 15In those days and at that time I will cause a righteous Branch to spring up for David; and he shall execute justice and righteousness in the land. 1. The Bible is filled with horticultural and agricultural imagery like "branch." A branch comes from the strong trunk or center of a tree. David, by then the long-ago king of Israel, was to be the forebear of a new King Who would restore God's people. This commenter at Althouse calls the experience of being the first to open the paper in the morrning "sublime." That brought back a happy childhood memory. As I was growing up, my parents subscribed to both a morning and an afternoon newspapers. But they didn't get the Sunday paper by home delivery. Instead, because we were all nightowls, my father--usually accompanied by one of the kids--would go to a corner market and pick up a copy of the Sunday paper right after it was delivered to stores on Saturday nights. It triggered a weekend ritual, the entire family tearing into the thick Sunday edition, sprawled out at different places in the living room, reading, a late movie playing on the TV, as we sipped Coca-Colas and munched on the popcorn my dad had popped. What kind of person sees an unknown number on their caller ID and calls it back to ask, "Did someone at this number call me?" Why Would I Want to Force Keith Ellison to Use the Bible When He Takes the Oath of Office in January? Talk show host Dennis Prager has created quite a stir by suggesting that Keith Ellison, set to become the first Muslim member of the United States House of Representatives, should not be allowed to use a Koran during his swearing-in. ...is an act of hubris that perfectly exemplifies multiculturalist activism -- my culture trumps America's culture. What Ellison and his Muslim and leftist supporters are saying is that it is of no consequence what America holds as its holiest book; all that matters is what any individual holds to be his holiest book. Both as a Christian and an American, I think that Prager is completely wrong. Why? First, there's a little thing we Christians call "the Golden Rule." It was enunciated by Jesus, Who we believe is God as well as human, meaning that His word carries more than a little weight with us. Jesus said, "In everything do to others as you would have them do to you..." (Matthew 7:12) As a Christian, I would be deeply resentful if I were forced to use a Koran when I swore an oath of office. Constitutional issues aside for a moment, no person should be forced to use the religious symbols or texts of any faith against their wills. Christianity insists that no one can come to faith in Christ or be under the authority of God's Word by anything other than voluntary means. For Christians, faith in God is about having a trusting relationship with Christ, not adhering to some values system. Although as a Christian, I hope that all people will come to follow Jesus Christ, I also believe that we need to be respectful of those who adhere to religious views different from our own. In December, for example, I'm scheduled to lead the prayer for the opening of a session at the Ohio House of Representatives in Columbus. I'll be identified as a Christian pastor because I believe Jesus Christ the way I gain access to God. However, I will word my prayer in such a way that I hope will convey respect for others' sensibilities. This isn't about being politically correct; it's about being a Christian. The apostle Peter, no slouch about sharing his faith in Christ, advised Christians: "Always be ready to make your defense to anyone who demands from you an accounting for the hope that is in you; yet do it with gentleness and reverence" (First Peter 3:15-16). Prager's argument that the Bible is the source of the ideas that animated this country's founding is an oversimplification. The America of the 1770s and 80s was largely unchurched and spiritually-disconnected, although some of the Founders--people like John Witherspoon, a Presbyterian clergyman, and John Adams--were committed Christians. Thomas Jefferson, on the other hand, worshiped humanity, most especially himself, and only invoked the name of a nebulous God to buttress his political points. As a Christian, I believe that obeying the Constitution is not only legally right, but in the interest of our faith. The government which can today insist that everybody use our holy book, the Bible, for oath-takings could just as easily demand that people be forced to use the Koran or a Betty Crocker Cookbook next week. In the free and open marketplace of ideas, I'm convinced that the Christian faith is so true and Jesus Christ so compelling, that people will voluntarily want to follow Christ when given the opportunity. So, I feel no need to force my faith down others' throats. Besides all of which, as I've hinted above, I have no interest in the Bible being used as a symbol of cultural unity, as Prager suggests. As a Christian, I believe that the Bible is the living Word of God. It's more than a book of ideas. It's the definitive, authoritative voice with which God speaks to us. It can't and shouldn't be used to support any particular political system or nation, no matter how much I revere the system or love my country. In essence, Dennis Prager wants not to elevate the Bible, but to trivialize it and put it in a box marked America or national value system. The Bible is much too big a book for such small potatoes because the God Who speaks in it is vastly bigger than the finite--if laudable--nations and political systems devised by human beings. I frankly consider Prager's suggestion insulting to Christian faith and to the Bible, however unintentional the insult may be. Given all this, why would I want to force Keith Ellison to use the Bible when he takes the oath of office in January? Is Belief in God Bad for the World? As a former atheist myself, I’ve seen that most people who don’t believe in God are caring sorts horrified by the suffering of the human race, especially the suffering caused by humanity’s inhumanity. They’re unable to square these realities with notions of an all-powerful and loving God. I believe that our horror at human pain and injustice point us to a God Who planted in us notions about love and neighborliness. But I do respect atheists and agnostics who hang their beliefs on their horror at suffering. Whatever deficiencies I may see in their arguments against God, I understand the love of neighbor that so often informs them. More difficult for me to understand is another sort of atheist, the angry kind. They claim that all of the world’s ills have been caused by faith in God. To some extent, I suppose, this diagnosis makes sense. Islamists hijack one religion to wreak terror in much of the world and some so-called Christians use Jesus to force their political agendas down others’ throats. But even when I was an atheist, I knew that Christians who adopt an attitude of domineering moral superiority don’t really represent faith, at least not Christian faith. What I’ve learned is that most Christians admit their faults, but, grateful for the love of God they believe comes to the world through Jesus Christ, commit themselves to serving others. As Christians serve their neighbor, they help solve the world’s problems, not create them. I have a feeling that the story of the modestly-sized congregation I serve as pastor, Friendship Lutheran Church near Amelia, is representative of the stories of most Christian churches in the world. We’ve adopted serving others in the Name of Jesus as a central component of our life together. Here are some of the service projects in which we’ve been involved over the last several months: volunteering more than 500-hours in various social service agencies and community projects outside of our congregation; collecting coats for the homeless; gathering food and toiletries for the needy; providing healthy snacks for the Boys and Girls Clubs of Clermont County; collecting items for and then assembling duffel bags for children taken into foster care and distributed by CASA for Clermont Kids! ; providing care packages for the elderly in our local nursing homes; sending Christmas shoe boxes filled with toys, toiletries, and practical gifts to impoverished children in far-off countries; enabling World Vision to provide clean drinking water, milk cows, farming help, education, and Biblical instruction to the village of Sinankosi Moyo, the Zimbabwean girl we sponsor; sending money to the victims of disasters from New Orleans to Indonesia; collecting and sending money for use by Lutheran World Relief to feed hungry people; helping to secure funding for a new Habitat for Humanity project happening in New Richmond after the first of the year, a project for which we’ll also provide volunteers; and making our building facilities available to all sorts of community groups and agencies. We don’t do these things because we’re morally superior people. We believe Jesus is right: only God is good. We do them because we’re forgiven people who want to love and serve others as Christ has loved and served us. We do them because we’re grateful to God. And we do them because we want to be authentic Christians, imperfect but forgiven people who roll up our sleeves and love the world God loves. Maybe if some of today’s angry atheists spent one month in the worship services and service activities of the average Christian church around the corner, they might not change their minds about God, but at least they’d see that faith in God isn’t a bad thing. Is There a Frist in Our Future? ...when I spoke with [Frist]...he seemed like an extremely intelligent, impressive and well-informed guy...that has not been my typical experience when conference-calling with Republican machers. I also recall my chance meeting with a Republican Senator on the golf course a couple of years ago. His praise for Frist was obviously sincere and heartfelt. Frist has obviously made the right move in not running. The entire Congress the last few years has been an epic disappointment, and as the leader of the Senate there was no conceivable way he could skate away from that record. But in considering Frist’s future, it’s worth noting that this Senator from a mid-sized state and with short-term service was recognized by his colleagues as the man who should lead them. Furthermore, First was never plagued with the kind of grumblings that went on behind Coach Hastert’s and President Bush’s backs, even as the 2006 election season began to resemble a political Hindenburg. Frist has much more to offer. Retiring from the field at this point in time is the best way for him to maintain his ability to do so. Some say that John Kerry, who hasn't stopped running for President since the 2004 race, would do well to withdraw from his bid for the 2008 Democratic nomination and so, like Frist, enhance his credibility for the future. The presidential fever, from which Kerry has suffered his entire life, is a virulent virus that beclouds judgment and will, if its victims aren't careful, turn them into Harold Stassen or Eugene McCarthy. Maybe Kerry needs to contact Dr. Frist and ask for the cure. [UPDATE, An Explanation: For the younger set, Stassen was a one-time Republican kid-governor and McCarthy the first Democrat to challenge Lyndon Johnson for the presidential nomination in 1968. Both apparently began as serious political figures. But their perennial campaigning for president, way beyond any realistic hope of getting to the White House, made them, in the end, objects of ridicule and marginalization. [The moment that best captures this in Stassen's case came at the 1968 GOP convention, thirty years after his first promising rise to prominence. After his name was put in nomination for the presidency, Stassen's one-and-only delegate, his nephew, was the only participant in the then-customary floor demonstration accorded each candidate. Demonstrations usually included confetti, streamers, loud brass bands, and chanting, marching delegates. Stassen's floor demonstration consisted of his nephew laughingly and good-naturedly walking around the hall with a transistor radio blaring music. The very young Ohio State Buckeye men's basketball team went to Chapel Hill and did extremely well against a talented University of North Carolina Tarheels team. It portends great things for a team waiting for its star player to recover from surgery. My friend and mentor, Ron Claussen, has a new web site. I hope that you'll visit there soon. My brother has the 411. In this post, I talked about how Hollywood and the fashion industry do young women a disservice by pushing emaciation as a "good look." Some may wonder why I, as a Christian pastor, feel that this is such an important issue. To me, fighting the "thin is in" emphasis is not just a health issue, but also a profoundly important spiritual one. At the root of any eating disorder is a deep-seated struggle with self-esteem. As a Christian, I believe that God has repeatedly revealed that no human being should ever suffer from a poor self-concept. For God so loved Mary that he gave his only Son, so that when Mary believes in him she may not perish but may have eternal life. The point is clear: Every individual has infinite value in the eyes of the God of the universe. Some people may deride us because we don't conform to their arbitrary norms for us. But God was willing to die and rise for us and values us for all eternity. An important concept for Christians is stewardship. Usually, people think this only has to do with financial management. But in fact, stewardship is the grateful management Christians are called to apply to all of God's gifts to us: our relationships, our time, our talents, our minds, and our bodies. A passage in the New Testament, First Corinthians 6:19 says that "your body is a temple of the Holy Spirit within you, which you have from God." The verse goes on to say that our bodies aren't really our own, but God's. The specific issue addressed by the passage is sexual immorality. But it also tells us that we should avoid abusing our bodies, whether by failing to exercise, overeating, or undereating. In my earlier post, I made the point that parental love could drown out the siren song of "thin is in." It's important that parents take up the call to build up their kids. The Bible says that encouraging their children is one of the most important functions of parents. Discipline and love is to be applied to help them not only to learn to love God and love neighbor, but also to feel confident about life. For example, at one place in the New Testament, the apostle Paul urges fathers to be restrained in the use of discipline. "Fathers," he wrote, "do not provoke your children, or they may lose heart" (Colossians 3:19). All children are precious. I wish that all of them could know that. That's what Irena Medavoy says after the tragic death of another fashion model on November 14. Ana Carolina Reston died of complications caused by anorexia. But, of course, the real cause of her death is a media-created notion that thin and dead is preferable to normal and healthy. When is the fashion establishment going to take responsibility for what is happening to women in our culture? When are we going to stop rewarding our young celebrities - like Nicole Ritchie - for not eating by following them doggedly and featuring them on the covers of our magazines? "This skinny thing, it angers me so much. It disturbs me. "I'm happy with my shape and size; I work out when I get the time. I accepted a long time ago that I wasn't going to be able to wear skinny jeans. I'm fine with that. "In the past, people have been a little unkind when it comes to discussing my weight, but I realise its' them, not me. "I'm totally fine with how I look and the weight I am." Winslet has always impressed me as being a self-assured person, able to take risks as an artist and a human being. (She even used her success in Titanic, a movie I doubt that she cared for, to take on more substantive and interesting film roles.) In her self-confident push for personal excellence, she's a terrific role model for young women around the world. But not all young women have Winslet's confidence. They imbibe the murderous "thin is in" propaganda and mindset of the fashion and music industries. It isn't just supermodels who get sick and die because of this push: They influence millions of female tweens, teens, and adults. These two businesses should be ashamed for the thousands of deaths they've probably caused by idealizing emaciated bodies as the norm for women. It's indefensible! Of course, the emaciation mandate is nothing new. MGM executives were no doubt the ultimate culprits behind the early death of Judy Garland, for example. Throughout the 1930s and 1940s, they deliberately underfed her and plied her with weight-reduction drugs to which she became addicted. With the death of Ana Carolina Reston, one wonders when this madness might end. I don't look for it any time soon. The best thing that parents can do for their girls from an early age, is tell them that they're loved and valued just as they are. No need for petite sizes. No need for diets. No need for purging. Just love your daughters, parents. Parental love is the most potent defense against the fashionistas who apparently want to see our daughters dead. As long as our young women are buried in one of their expensive pairs of jeans, they're okay with that. So You Think Slavery is a Thing of the Past? In 2004, the U.S. Government estimated that of the 600,000 to 800,000 men, women, and children trafficked across international borders each year, approximately 80 percent are women and girls, and up to 50 percent are minors. The data also demonstrated that the majority of transnational victims were trafficked into commercial sexual exploitation. The International Labor Organization (ILO)—the United Nations (UN) agency charged with addressing labor standards, employment, and social protection issues—estimates there are 12.3 million people in forced labor, bonded labor, forced child labor, and sexual servitude at any given time. If the estimate is correct it means that there are more people living in slavery than there are people who live in New York City and Los Angeles combined. With millions of economically and socially vulnerable people around the world, the "supply" of potential slaves today makes them cheaper than they’ve ever been in the history of the world. An average slave in the American South in 1850 cost the equivalent of $40,000 in today's money; today a slave costs an average of $90. Because they can be had so cheaply, they are of little value to the traffickers. If slaves get sick or injured or merely outlive their usefulness they are often dumped or killed. Bales also notes that, "While the 27 million people enslaved today are the largest number of slaves alive at any time in human history, they are also the smallest proportion of the world population to ever be held in slavery." That fact provides some hope that with fewer stakeholders in modern slavery, it can be eradicated. Petition all governments countenancing the trade to enforce their own anti-slavery laws. Go to Free the Slaves.net to learn more about what you can do. 1. This is one of the Bible lessons appointed for the First Sunday in Advent in Year C of the three-year lectionary cycle. 2. Advent means coming. During this season that kicks off the Church Year, we remember how the the ancient Hebrews once awaited the coming of the Messiah (the anointed king), who would execute justice and righteousness. We also remember that we await the return of that Messiah, Jesus, on what the Bible typically calls the Day. Then, we believe, all will be put right with God's creation and the faith of those who have trusted in Christ will be vindicated. 3. Jeremiah was a--you thought I was going to say "bullfrog," didn't you?--a prophet who lived during the sixth century BC. Throughout his ministry, he warned the people of Judah that there would be drastic consequences suffered for their worship of other gods, the haughtiness of their rulers, and the excising of God, Yahweh, from national life. They couldn't smugly presume on God's grace. Jeremiah said that Judah--what would later be known as Judea--would be conquered by another people, the walls of Jerusalem breached and overcome. 4. But Jeremiah also insisted that God is gracious, that He would forgive a repentant people, and restore the life and well-being of a Judea that turned to Him. He based this assertion on how God had acted for His people in the past. 5. Most scholars however, seem to believe that our lesson for this week was not written by Jeremiah and that it was actually composed by a later scribe, although they believe that our passage is a reworking of another indisputably written by the prophet, Jeremiah 23:5-6. There are several pieces of evidence to support scholars in this belief. For one thing, our lesson doesn't appear in the Septuagint, the Greek translation Old Testament produced in Alexandria at around the third century-BC. (Its purpose was to allow Jews dispersed throughout the Mediterranean, who no longer knew Hebrew, to nonetheless read God's Word.) This suggests, the scholars say, that our lesson was written after the commonly-accepted version of Jeremiah had been around for awhile and then, only appeared in the Hebrew. Here, the prophet expressed hope for the restoration of Judah (or Judea, the land in which Jesus would live centuries later) and Israel. After the reign of King Solomon in the tenth century BC, Israel split in two. The southern kingdom, Judah, was centered in Jerusalem. The northern kingdom, Israel, was centered in Samaria, the name by which it also came to be known. The split was precipitated by the selfish desire for power and it kicked off a pattern of ongoing faithlessness to God and a succession of mostly bad kings in both countries. During Jeremiah's time, hope that a good king who would acknowledge God alone arose during the reign of Josiah in Judea. His reforms included ridding the country of idol worship and a commitment to doing God's will. 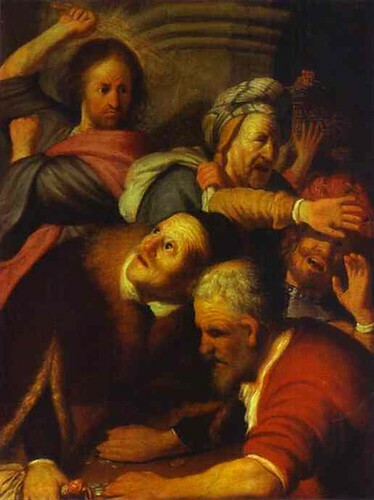 But Josiah tragically died after a short reign and with him, his reforms died. The nation went madly on with its sinning. The point is this: Jeremiah looked forward to a time when both Judea and Israel would be restored in faithfulness to God. But, by the time our lesson was written, Samaria no longer existed as a separate country. It had been conquered and destroyed. In our lesson, the scholars argue, the hope expressed by Jeremiah from a year before has been reworked. Now, the hope is expressed is for Jerusalem and Judah alone. Notions of authorship were very different in those days. 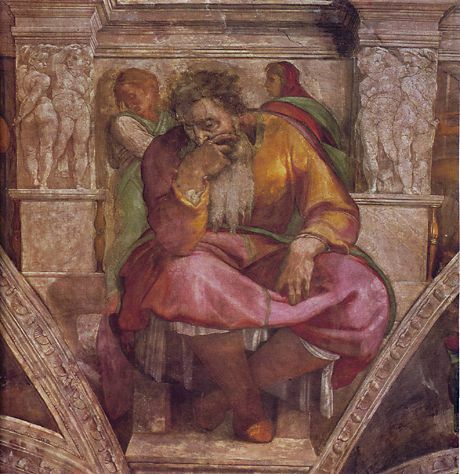 It would not be considered illegitimate for a scribe or later student of Jeremiah to have written oracles consistent with Jeremiah's teachings into the prophet's book. 6. So, what if the scholars are right about our lesson not being written by Jeremiah? It really doesn't change much. The prophecy still points to a God Who remains in control. Even after He has chastised His people--executing justice, He remains sovereign and He still loves His people. There is still reason to hope beyond whatever crucibles we may experience. 7. As we have Jeremiah in our Bibles, Jeremiah 33:14-16 is part of what's known as the Book of Consolation. This is the fourth of seven oracles of promise contained within that "book." 8. The early Christians saw in this passage a clear relationship to Jesus. Jesus is the King Who, unlike purely human kings, can be relied upon to execute justice and righteousness. In Jesus, we experience the Messiah Who forgives sin and puts things to right in our lives and Who, one day, will do so for all the world. That's why a simple prayer of excited anticipation is appropriate during this Advent season, "Come, Lord Jesus!" For this installment--and the next three--I'm taking a different approach. The story I want to tell you is that of Ruth, from the Old Testament. But instead of re-telling in my words, I'm simply going to present Eugene Peterson's wonderful rendering of it in The Message, a chapter at a time, followed by a few comments from me. I hope that this isn't a violation of copyright laws. If it is, I hope that I'll be forgiven...and I hope that everybody who reads this will buy The Message. 1-2Once upon a time—it was back in the days when judges led Israel— there was a famine in the land. A man from Bethlehem in Judah left home to live in the country of Moab, he and his wife and his two sons. The man's name was Elimelech; his wife's name was Naomi; his sons were named Mahlon and Kilion—all Ephrathites from Bethlehem in Judah. They all went to the country of Moab and settled there. 1. The judges were people in the land of Israel who God periodically called to do things like lead armies and arbitrate disputes among the people. Later, reluctantly, God would accede to Israel's desire to have kings like the countries that surrounded them. But things rarely went well. In an ultimate sense, things never really go well when we let anyone or anything--even our families--have a higher place in our priorities than God. 2. There are several bits of irony in these opening verses. For one thing, Bethlehem is Hebrew for House of Bread. There was no food in the House of Bread. What happens when the bread basket gives out? Refugees go to where they might find food. That's what this family from Bethlehem did. The other irony is where they go: Moab. (Two syllables, the first sounding like "mo" in the word motion and the second with a short a, like the a in abs.) Moab was directly east of the Dead Sea and its people, the Moabites, were fierce enemies of God's people, the Israelites. But when you're hungry, you pretty much don't care who your neighbors are if there's food at hand. 1. One tragedy after another befalls this family. There was joy that the boys found wives, no doubt. But then, in rapid succession, all the male members of the family die, first the father and then the grown sons. 2. Widows, for the most part, had zero standing in these ancient near Eastern cultures. Rarely did they have property rights. A widow might hope to be taken in by her father, if he were still alive. Her best hope of avoiding destitution would have been to get married again...and quickly. But many widows were forced into prostitution. That's one aspect of the story of Ruth (and her mother, Naomi) that's so remarkable. This is the tale of faithful, resilient--even heroic--women who, in spite of heartache, continue to follow God and demonstrate admirable shrewdness. They exemplify the characteristics which Jesus says all believers should display: They're as wise as serpents and as innocent as doves. The Hebrews, in spite of being a patriarchal society, were unafraid to have female heroes of faith. 1. The two daughters-in-law, amazingly want to go back to Israel with Naomi. As young women, they might hope to be taken back into their respective fathers' homes, avoiding poverty and humiliation. But they appear committed to their mother-in-law. This is some measure of the love that bound the three together. And something else: At least in Ruth's case, we'll soon see, there is also a devotion to the God which Naomi and her family claimed was the one true Lord of creation. 8-9 After a short while on the road, Naomi told her two daughters-in-law, "Go back. Go home and live with your mothers. And may God treat you as graciously as you treated your deceased husbands and me. May God give each of you a new home and a new husband!" She kissed them and they cried openly. 10 They said, "No, we're going on with you to your people." 11-13 But Naomi was firm: "Go back, my dear daughters. Why would you come with me? Do you suppose I still have sons in my womb who can become your future husbands? Go back, dear daughters—on your way, please! I'm too old to get a husband. Why, even if I said, 'There's still hope!' and this very night got a man and had sons, can you imagine being satisfied to wait until they were grown? Would you wait that long to get married again? No, dear daughters; this is a bitter pill for me to swallow—more bitter for me than for you. God has dealt me a hard blow." 1. In those days, the next unmarried brothers of a deceased man would be obligated to marry his brother's widow. But Naomi is pointing out that it's highly unlikely that she will have any sons soon. Orpah and Ruth would have little chance at a good life in Israel. Naomi, as always, was being practical in telling the her daughters-in-law to stay in Moab. 2. In speaking of how bitter her life has become, Naomi gives us more of the irony that fills this little book. Her name, Naomi, means sweet. One commentary suggests that her name was roughly equivalent to the term, sweetheart, as we use it today. Life has become bitter for Naomi. Having faith doesn't mean that our lives are all sweetness. 14 Again they cried openly. Orpah kissed her mother-in-law good-bye; but Ruth embraced her and held on. 15 Naomi said, "Look, your sister-in-law is going back home to live with her own people and gods; go with her." 16-17 But Ruth said, "Don't force me to leave you; don't make me go home. Where you go, I go; and where you live, I'll live. Your people are my people, your God is my god; where you die, I'll die, and that's where I'll be buried, so help me God—not even death itself is going to come between us!" 18-19 When Naomi saw that Ruth had her heart set on going with her, she gave in. And so the two of them traveled on together to Bethlehem. When they arrived in Bethlehem the whole town was soon buzzing: "Is this really our Naomi? And after all this time!" 1. Ruth not only expresses her love and allegiance to her mother-in-law, but also to her mother-in-law's God and people. Through her husband's family, she has come to know and worship the one true God revealed to the Israelites. 2. This passage is often read or sung at weddings. There's nothing especially wrong with that. But it's interesting to note that like that other famous "wedding Scripture," First Corinthians 13, this passage had nothing to do with marriage at all. 20-21 But she said, "Don't call me Naomi; call me Bitter. The Strong One has dealt me a bitter blow. I left here full of life, and God has brought me back with nothing but the clothes on my back. Why would you call me Naomi? God certainly doesn't. The Strong One ruined me." 1. Naomi blames her tragedies on God. Whether we agree with their view or not, the ancient Hebrews unflinchingly believed that God, as Sovereign, orchestrated the good and the evil that befell them. I say "unflinchingly" because, in spite of the incredible psychological, intellectual, and emotional issues this belief raised, their notion that God had a right to do what He might was so strong that it seldom caused them to doubt their basic belief in God. Our post-modern belief in personal sovereignty--in our capacity and our "right" to do what we want--is so strong that we're inclined to find reasons not to believe in or follow God in life's inconveniences, adversity, or tragedy . To blame our tragedies on God isn't evidence of faithlessness, although it may indicate that we haven't taken every aspect of our tragedies into consideration. The person who "blames God" or gets angry with God nonetheless believes in God. You hardly become angry with someone you don't think exists. 2. The actual name Naomi asks her Bethlehem neighbors to call her is Mara, which means Bitter. In ancient Hebrew culture, a lot of stock was put in names. Names were thought to express some deep truth about a person or to contribute to their destiny. Naomi's life was far from sweet and, she felt, a new name was warranted. Today, of course, we generally give names that to our children that we happen to like. It's in our nicknames that we act more like the Hebrews. Since I was about four years old, it's been rare for any member of my family to call me by my given name, for example. The first of four younger siblings tried to call me "brother," and I've been "Bub" or "Bubba" ever since. I'm even Uncle Bub to my nieces and nephews. Sometimes nicknames are used almost in the same way Hebrews used names, as something like an article of faith about their destiny. Years ago, I read about a football coach who wanted to encourage his players toward excellence. So, he started calling the slowest runner on the team by the nickname of Speedy. In time, Speedy became the fastest player on the team. 1. Two important facts to remember here. First, Ruth, a foreigner, not a member of God's people. Second, harvest time, a time when God commanded His people to leave some portion of the harvest in the fields, so that the poor and the foreigners among them could glean some of the crop and so, not go hungry. We'll leave it there until the next time. The Ohio State University becomes the first school in thirty-three years to hold #1 rankings in football and men's basketball at the same time. but this is a solid and interesting account of the early history of Lutherans in North America. I took a basket of dirty clothes to the basement this morning and suddenly was reminded that in 1979, I sought a favor from Ohio's now-US Senator-Elect, Sherrod Brown. Brown granted me the favor. Is that scandalous? You be the judge. First, a bit of background. For more than two years, from late 1976 to late 1978, I relentlessly nagged the then-Executive Secretary of the Ohio House of Representatives, Joe Sommer, to hire me. I'd always wanted to work at the State House. It had been a goal of mine from childhood. Through the years, the primary tool I've used to achieve my goals has been nagging. It's how I convinced my wife to marry me and later, in spite of my poor undergraduate record, it's the way I got the admissions people at Trinity Lutheran Seminary to let me study to become a pastor. After I'd made a complete pest of myself, Sommer approached the Speaker of the House, Vern Riffe about bringing me on as supervisor of the college pages. I began the job in January, 1979. The office from which I did my work also happened to be the place where House members and staff could pick up copies of most of the state's major newspapers. Among our regular clientele was Sherrod Brown, an affable fellow about my age who then represented House District #61, near Mansfield. I knew about Brown before I arrived at the State House, of course, and honestly, I was in awe of him. Fresh out of college, he'd hit the bricks in his first campaign for public office...and won. The fact that he'd accomplished this at so young an age amazed me! I could have been envious, resentful of his status, I suppose. But Brown's demeanor made that impossible. Unlike many people who gain public office or notoriety at a young age, Brown had no airs. He was a down-to-earth guy who seemed to take his work seriously, but not himself. I always enjoyed our rapid daily chats. It was because of his friendly accessibility that I approached Brown for a political favor, the physical evidence for which sets before me now. I'd long forgotten it until I noticed it today, visible with a group of sacked items setting near our washing machine, placed there after a recent basement cleaning frenzy. In short, I asked Sherrod Brown to sponsor a Resolution honoring my wife on her twenty-seventh birthday. "On behalf of the members of the House of Representatives of the 113th General Assembly of Ohio, we are pleased to take this opportunity to congratulate ANN DANIELS on the occasion of her twenty-seventh birthday. "Despite advancing years and the handicap of a husband of dubious character, you continue to be a vital member of society and a revered citizen of our state. "Your contribution to the Arts in Columbus...; your work with Bethlehem Lutheran Church; your friendships; and the cheerful, efficient manner in which you care for a virtually helpless spouse have earned you the plaudits of our state. "Good luck, God bless and may you have many more." The document was signed by Brown and Speaker Riffe. What does all of this say about Sherrod Brown? First of all, it says that at least twenty-seven years ago, he had a great sense of humor. He'll probably need that on his new job in Washington. Secondly, it may say that he's a bit sadistic. I remember him laughing at my proposed text, but not once did he say, "Hey Mark, are you sure you want to be called 'helpless' and 'of dubious character' here?" And so the State of Ohio is still officially on record as tagging me with these labels. I wonder if that wasn't Sherrod Brown's game all along? Hmmm. The last time I saw or spoke with Brown was in early-1980. By that time, I'd left the State House and was enrolled in the Master of Divinity program at the seminary. A professor, aware of my former place of employment, had asked me to find a politician who was also a Christian and might be willing to talk about the role faith played in his public policy decisionmaking. After I made a phone call, Brown spoke to the prof's class and the-then State Representative and I had another chat during a coffee break the same day. The real reason I tell this story is that, amid the uncivil frothing at the mouth that passes for political debate these days, we all too often forget that our public officials are real human beings. Many are decent people. Often, they have a sense of humor. And, whether we agree with their politics or not, I think we should remember these things. Living with Christ our King! Part of what Jesus says here is easy for me to understand. Sometimes when we’re in worship, a baby starts to cry in the nursery. Most of us in the sanctuary have no idea which of the children it is. But there are usually two people who know immediately: the parents. With the first whelp, at least one of them is out of their seat to see if anything is wrong. Elsewhere, Jesus says that He is the Good Shepherd to us, His sheep, and that we know His voice when we hear it. When we’re part of Jesus’ Kingdom, when we’ve come to believe in Him, His voice can be heard above the din of our own selfishness and sin and the temptations that surround us. So it’s easy to get part of what Jesus means when He says: “Everyone who belongs to the truth listens to my voice.” But what does it mean to “belong to the truth”? Jesus Himself is the truth, the strong foundation on Whom we can build our lives. In another of the Gospel books, Jesus says that wise people build their houses--their lives--on the rock. Jesus is the true rock. To base our lives on anyone or anything other than Him is a lie that leads to death and separation from God. According to Jesus, He is the true and only way to life with God that lasts forever. Every time we read the Bible or spend time in worship. Every time we pray together or alone. Each time we receive Holy Communion. And whenever we serve in His Name. This connectedness to Him is what the Bible calls abiding in Jesus. But what does all of this mean for you and me as we live from day to day? What might it mean for our congregation to live with Jesus as our King every moment of every day? The vision for Friendship Lutheran Church has always been about sharing and living in intimate fellowship with Jesus, the King. I’ve said that Friendship is the most Lutheran congregation in the world because like Martin Luther and the other reformers in the sixteenth century, we work to tear down all those barriers that so often prevent people from gaining access to Jesus, His forgiveness, His life, and His Kingdom. So, as the old Church Year closes and we begin a new one next weekend, it’s a good time to renew that vision. I want to suggest where Friendship needs to be headed in 2007. This Friendship Vision 2007 boils down to four essential elements. First: Exalt the Lord. When we exalt someone or something, we give our praise or honor. Another term for it would be worship. People who want to hear Jesus’ voice in their everyday lives, seek to honor Him not just on Saturdays or Sundays, but all the time. I once heard about a talented football player who went to a top Division 1 college team, but turned out to be a total bust. This kid everyone had expected to be among the best quarterbacks in the country, maybe a Heisman Trophy winner, rode the bench for four years. As it developed, he proved to be indifferent to his coaches’ instructions, spent little time looking at the playbook, and had little to do with his teammates. Without those connections, his playing career died, the victim of what I call, “permanent potential.” Sadly, that seems to be the same condition from which most Christians and most churches suffer, never becoming what God has in mind for us when He calls us to follow Christ our King. You and I may look at some Christians and see them exhibit joy in the midst of hardship or purpose in the midst of chaos and wonder how it’s possible. It’s simple: They’ve maintained contact with Christ. They’ve adopted the habit of exalting the Lord. And make no mistake about it: You cannot continue in a strong relationship with Jesus Christ unless you trigger this pattern of exalting Him. You trigger the habit of worshiping Christ with your whole life by regularly attending worship with your Christian family, the church. Some of you have heard the story of the Scottish pastor who visited a member who hadn’t been in worship for a long time. The parishioner expected that the pastor was going to give him a tougue-lashing. But nothing of the sort happened. Without regular worship with the Church, the flame of our faith dies out. For us to exalt the Lord on Mondays, we need to exalt Him together on Saturdays or Sundays. This place should be packed every weekend! When just one of us is missing, we can’t give each other the mutual encouragement to daily exalting God the church is meant to provide to us. We need to challenge one another to be in weekend worship together at least three times a month. And you don’t need my permission to call up the people you haven’t seen in worship for awhile. Pick up your phones and call them! Second: Each one reach one. Anyone attentive to the voice of Jesus knows how desperate He is for us to reach out to others with the Good News of Jesus Christ. If each of us prayerfully committed ourselves to heeding Jesus’ call to make disciples by bringing a spiritually disconnected person into relationship with Christ through our congregation, we would double in size by next December. The more members, the bigger Christ’s Kingdom and the more of Christ’s work we can do together. We should be doubling in size every year! Early next year I’ll be offering you practical help with how to share your faith in Christ with others. But you don’t need Mark’s program. Jesus Christ lives in you. The Holy Spirit is with you. All you need to do is tell your friends about your best friend, Jesus Christ, and about this incredible fellowship of Christians of which we’re a part, Friendship Lutheran Church. Before you go to bed tonight, talk with the Lord. Ask Him to tell you who you will reach in 2007. If each one will reach one in 2007, we will all have the satisfaction of knowing that God has used us to bring another person to heaven. Friendship Church is a welcoming and caring people who seek to share the kindness of God so that all metropolitan Cincinnati may grow in the faith, hope, and love of the living Jesus Christ! People made confident and hopeful by the love of God given to us through Christ serve others as Jesus has served us. That’s why I’m so excited about all that the Outreach/Servanthood team is doing and has planned for us. I’m proud of all the service I see you doing in Jesus’ Name. One of the great developments in the life of Friendship in 2006 is that servanthood has been wired into the DNA of our life together. Keep it up! Exalt the Lord. Each one reach one. Engage in service. One more: Expand your vision. The state of Ohio isn’t the only entity that should have Jesus’ words--”With God, all things are possible”--as its motto. Expand your vision for Friendship. Dream big dreams for what our congregation can do in service to God and our neighbors! But hear this warning: When you bring your vision before our Church Council and they affirm your vision as something Friendship should do, your role can’t end there. Backseat driving is no more attractive in the church than it is in your car! Back in Old Testament times, some of God’s people, the Jews, who had been living in exile, were allowed to return home. But one of them, Nehemiah, still living away from his homeland, learned that the city of Jerusalem had not yet been rebuilt. Its walls had crumbled and until they were put back up, the city was subject to marauding bands of thieves and thugs. Though he had no experience with building or leading work crews, Nehemiah felt the force of a dream to rebuild those walls. And with God’s help and empowerment, God used Nehemiah to accomplish that dream. When God plants an idea in your mind and soul for a new ministry, you, like Nehemiah, also must be willing to roll up your sleeves and take the lead in bringing the vision into being. Christianity isn’t a spectator sport. Everybody needs to get into the game. Exalt the Lord: Every member in worship regularly and each of us checking on those we haven’t seen there for awhile. Each one reach one, our congregation doubling in size by December, 2007. Engage in service, every member with a ministry. Expand the vision, each of us daring to make God-honoring dreams realities at Friendship. The time to get on board with what God has in mind for us is now. Christ our King awaits our response. Every believer in Jesus Christ has at least one spiritual gift. I read somewhere about a man who never opened his Christmas presents. Instead, each year, he placed his newest gifts under the tree with past years’ packages, all unopened. Like the man in that story though, most Christians never make the effort to open their spiritual gifts, often because they’re ignorant of them. Advent is the season of the Church Year that begins on December 3. The word advent, from which we get the word adventure, means coming. In this season just before Christmas, we remember the coming of God into our world through Jesus Christ. We remember too, that one day, Christ will come again. In the meantime, God invites Christians to live an adventure. He calls we Christians to open the spiritual gifts He’s given to us, maximizing our God-given potential and pointing others to the hope we have in Jesus Christ.